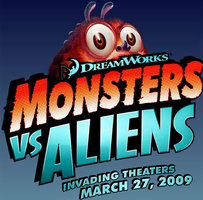 Monsters vs. Aliens: Mutant Pumpkins from Outer Space will air in primetime on NBC October 28, 2009. For now, press play once and sit back, as all five clips will play in sequence. 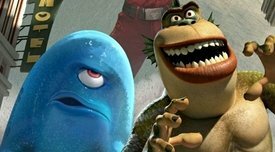 NBC has joined with DreamWorks Animation to air two all-new animated holiday television specials based on the studio’s feature films, “Monsters vs. Aliens” and “Madagascar,” both featuring many of the characters as voiced by the original talent from the films. The first of the 30-minute specials is titled, “Monsters vs. Aliens: Mutant Pumpkins from Outer Space.” It features the voices of cast members Reese Witherspoon, Seth Rogen, Hugh Laurie, Will Arnett, Kiefer Sutherland and Rainn Wilson. The special is set to air on Wednesday, October 28 (8-8:30 p.m. ET, repeating from 8:30-9 p.m. ET). The second special, “Merry Madagascar,” is scheduled to broadcast on Tuesday, November 17 (8-8:30 p.m. ET) and repeat on Saturday, November 28 (8-8:30 p.m. ET) just before the holiday season. AWN reports that DreamWorks Animation is undecided on whether or not to begin work on a Monsters vs. Aliens sequel. 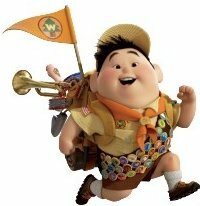 DreamWorks Animation CEO Jeffrey Katzenberg commented that a sequel is questionable after an unimpressive (by DreamWorks Animation standards) international performance. 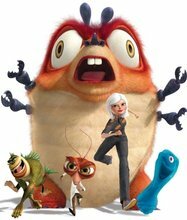 Monsters vs. Aliens grossed $377 million worldwide, with $198 million coming from the domestic market. According to Katzenberg, “Domestically it has performed at a level that would surely qualify it as a sequel, and internationally it did not. This is the first movie we’ve had that’s right on the bubble.” A decision will be made soon. Check out the rest at Yahoo! Movies. 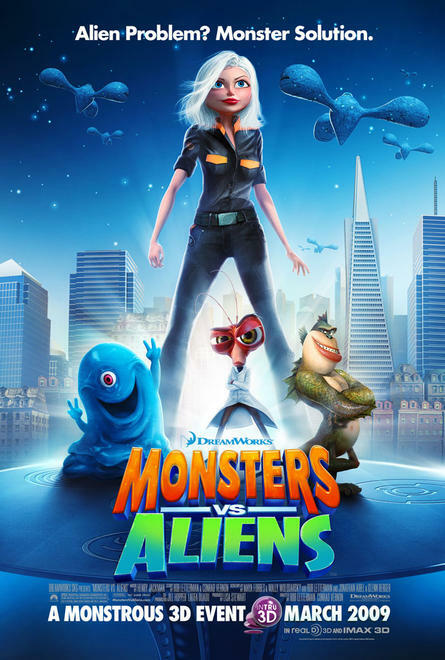 DreamWorks Animation announced recently that it will debut a 90-second 3D ad for their upcoming “Monsters vs. Aliens” film during Super Bowl XLIII. The commercial will be broadcast at the end of the 2nd quarter on NBC on Sunday, February 1, 2009. Viewers will also be treated to a 3D episode of CHUCK on Monday, February 2 at 9 p.m.
Intel has produced more than 125 million pairs of 3D glasses available at 25,000 SoBe Lifewater retail displays in participating stores. If you can’t find a pair, call 1-800-646-2904 to order a pair.